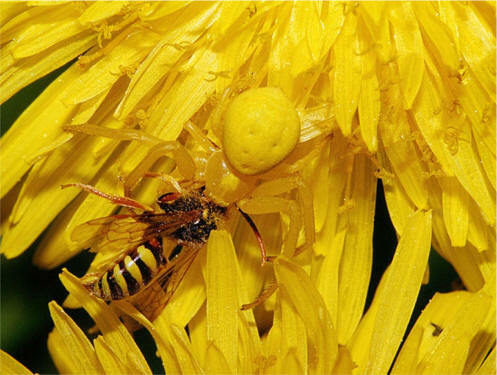 Goldenrod crab spiders are typically found on yellow or white flowers like goldenrod (hence the name) or daisies. 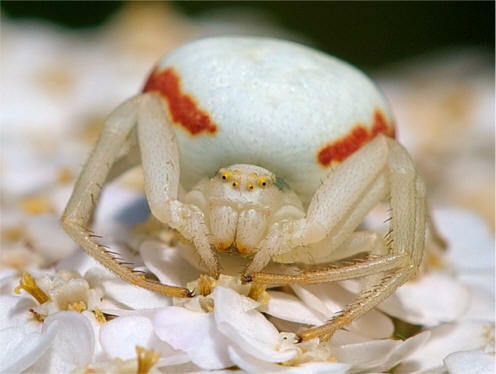 They are able to change their body color from white to yellow to blend in with the type of flower they are on. The female is larger and more recognizable (it's entire body, except for the red stripes on the side) changes color. The male has a brown thorax and front legs with only a small white or yellow abdomen. The color change is quite slow -- It can take nearly a month for the spider to change from white to yellow but only takes about a week to go the other way (from yellow to white). One of their favorite things to eat is wasps or bees, which gives you an idea of how large they are (they're about the size of a wasp). 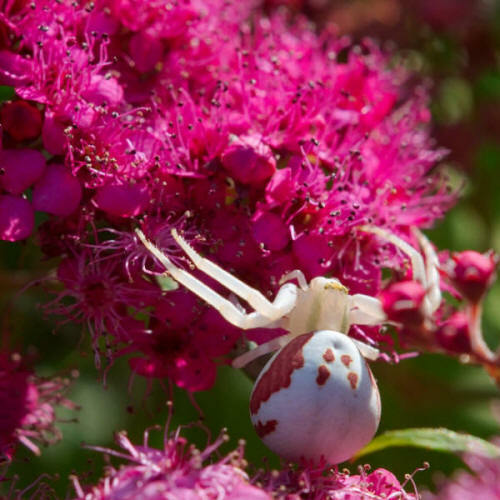 Goldenrod Crab Spiders are "hunters". They don't spin webs. Instead they wait, without moving, on the bloom of a flower. Because of their ability to change color, they blend in quite well. When an insect gets near, they grab it with their strong front legs and eat it immediately. The female spider can spin webbing. If you see them doing this, it isn't to catch prey -- it's to hold eggs! They usually fold a leaf over the eggs and spin webbing to secure them and hide them from predators. The mom will then wait around guarding the eggs -- until she dies. Now that's dedication!